Apple finally unveiled refreshed versions of the MacBook at an event last week, an event that saw two 13-inch and one 15-inch MacBook Pro 2016 laptops launched. Just like many rumors had pointed out, the new MacBook Pro 2016 is indeed a pleasure to look at, leave alone using. You will notice that the devices are a lot thinner than any of their predecessors. In addition, the company made the laptops lighter, but it gets better when you start interacting with the devices. Perhaps the most intriguing addition to the MacBook Pro 2016 is the touch bar, an OLED panel that takes the place of the function keys used on older models. However, not all three MacBooks have this feature. You only find it on one 13-inch variant and the 15-inch model, which also means that these two are priced higher than the entry-level model. As at the time of this writing, the entry-level MacBook Pro 2016 is already up for grabs via the official Apple retail stores and as a result, the device has already made its way to Other World Computing (OWC) company. The computer hardware company has already dismantled the laptop as it aims at giving us a view of what it inside the device. Following the teardown, OWC came in with a number of interesting discoveries with respect to the MacBook Pro 2016. For starters, the entry-level MacBook comes with a removable SSD. This means that this laptop is upgradable, which is contrary to initial reports that claimed the high-end 13-inch model and the 15-inch model were the only ones with this capability. Like the two, this entry-level model can get larger storage or easily replace the SSD in case of any damages. This is not a strange thing at all since other MacBook models have had this feature. However, since the SSD is usually attached to the logic board, the thinner body of the MacBook Pro 2016 threw in some doubts on whether this feature will indeed continue. But it has now been confirmed to be present, which is a welcome idea for Apple fans. As noted earlier, this discovery is based on a teardown of the non-Touch Bar MacBook Pro 2016 and as such, it cannot be confirmed whether the others have the same configuration. Still, expect to see some changes under the hood, especially since the flagship models have an extra component to support. This should happen once the 15-inch MacBook Pro 2016 is here, starting mid-November. 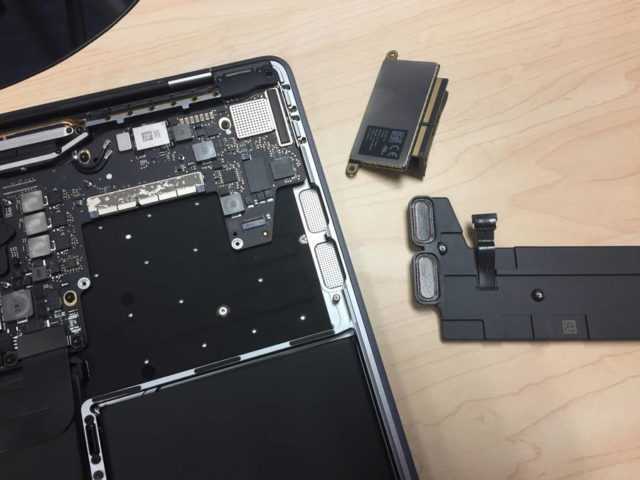 OWC also found out that the speaker of the MacBook Pro 2016 must be removed in order to pull back the SSD. In addition, this SSD has its interface port covered by a very strong tape.